This a from an oral presentation made to the Grand Lodge of New Mexico Ancient Free & Accepted Masons, on October 6, 2016 in Albuquerque. That is a bad poem. I wrote it this morning and it took me about a minute and a half. Does anyone recognize what kind of poem it is? It is known as a limerick. Limericks take their name from the City and County of Limerick in Ireland. There were a group of 18th Century poets and writers in Limerick known as the Maigue Poets. They often met and shared their work and sometimes, after several pints, would make up nonsense poems on the spot. One can imagine Dr. Seuss fitting in quite nicely with the Maigue poets. 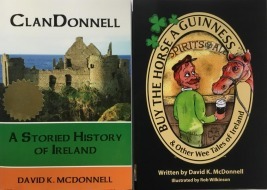 I wrote about one of the Maigue poets, John Clarach MacDomnaill in my book. The particular form of poem known as the Limerick actually originated in England a century later. But for some reason, they became known as limericks, perhaps since they were thought of as a derivation of the Maigue Poets' form of nonsense poetry. That is my introduction to you of the Irish city of Limerick. 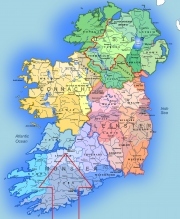 Here is Limerick on a map of Ireland. On a map of Ireland, Limerick looks like an inland city. It is not. It is located on the River Shannon, which begins north and east and flows into the Atlantic. Limerick is located at the point at which the Shannon widens and opens up to the Atlantic. The River Shannon is Ireland's longest river, and has functioned in Irish history and commerce much like the Mississippi River has to us. For centuries, goods - primarily agricultural products - produced in the central third or so of the country were delivered to the river banks, loaded on board boats or barges, and shipped down the Shannon to Limerick. I spent some time in Limerick and in County Clare and County Kerry last November, and you can see a steady stream of ocean going vessels going in and out of the Shannon. Limerick today is the island's fourth largest city. Going back more than a millennium, there were early Celtic settlements in and around Limerick, but none of them seemed to have had much permanence. The Vikings established a settlement there around the year 812. Many Irish coastal cities were established by the Vikings. Dublin is another example. Viking raiders sailed up the Shannon, raided Celtic villages, took whatever they could take, and then sailed back to Scandinavia. When that became too cumbersome, they established permanent settlements on the coast of Ireland. They didn't need to go back to Norway with their booty, they could drop it off. Eventually the Vikings in these settlements set up farms and raised cattle, and lived much like the Irish. They intermarried with the Irish as well. The Vikings adopted the Irish language and culture, and even the religion of St. Patrick. After several generations, it was difficult to tell the difference between the Celtic Irish and the Viking Irish. The Normans invaded Ireland in the 12th Century, with the full backing of English King Henry II. The English established a settlement on an island, which they named King's Island.